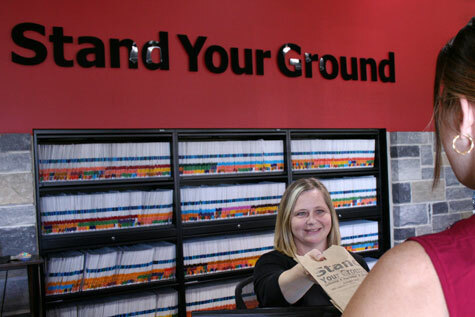 Stand Your Ground is a pedorthic clinic located in Kingston, Ontario just minutes off the 401. We offer many services including custom orthotic fabrication, professional footwear fitting and footwear modifications. Stand Your Ground has Canadian certified pedorthists whose vast experiences provide their clients with an in depth, hands on and personalized assessment. Our pedorthists provide clients with a detailed biomechanical and gait analysis followed by a custom treatment plan. Stand Your Ground also has professional shoe fitters who can help you find your perfect fit using our wide range of fashionable and functional orthopaedic footwear. We have a full line of diabetic off-loading footwear as well. Our on-site kinesiologist can help find a lower limb brace suited for many biomechanical problems. With an array of custom and off-the-shelf products (ankle, knee, AFO, plantar fasica night splints, toe props, etc) to support the lower limb, we can provide a good fit for many conditions. Our professional, hands-on approach provides custom, personalized results for each client. When a problem arises, visit your doctor then contact us to set up an appointment with one of our Canadian certified pedorthists to discuss your options.